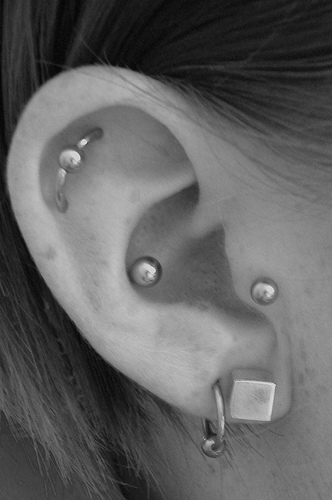 Today I will be discussing the tragus piercing. The tragus is the little nub in front of the ear canal. Most tragus piercings are performed while you’re lying down because the thick cartilage requires a bit more pressure to puncture, and it’s easier to keep your head still in this position. The piercing itself is usually made with a 18-16 gauge hollow piercing needle. The needle may either be straight or curved depending on the piercers preference. Once the hole is made, the jewelry is then threaded through. The tragus piercing can be done with a captive bead ring, barbells or even a labret stud. I prefer to use titanium posts because they have less chance of snagging during the healing period. Tragus piercings don’t tend hurt as much as you might expect because there are very few nerve endings in this location. It is normal to feel the pressure from the needle because of the exceptionally thick cartilage. It is also common to get some “sound effects” due to the location. You can expect to hear a popping sound although not everyone does. Not everyone has the correct anatomy for this piercing. Your piercer can look at it and let you know if you are a prime candidate for this piercing. Depending on the angle of your tragus it is usually placed perpendicular to the tissue. It should set well in from the edge. The tragus lacks vascularity (blood supply) so it can be tricky to heal. There is a tendency for cartilage piercings to develop small bumps during healing. They can be formed by the surface tissue being pushed away from the cartilage by the needle. Some piercers will compress the tissue after the piercing which can help reduce the risk of any bumps forming. If your tragus is to small, not properly pierced, or has had significant trauma you may face a risk of migration or rejection. Migration is when your jewelry moves closer to the surface tissue. It is possible for a piercing to migrate, settle, and heal. Your piercing should have 5/16 inch of tissue between the entrance and exit holes or you may have a strong possibility of losing it. Never let your jewelry come all the way through to the surface or you will often be left with a split scar. It is important to minimize trauma and pressure to successfully heal any cartilage piercing. Try sleeping on the opposite side while healing. Avoid snagging on hair or brushes. Avoid ear buds and phones. Try to use the phone on the side opposite of your piercing to not only avoid bumping but to avoid getting bacteria in your new piercing (phones are dirty). There is no need to twist or touch your jewelry as this will only irritate your new piercing. To clean your piercing you can either use H2Ocean or a saline soak. With the H2ocean spray both sides two to three times a day. You can make the saline soak at home by using a non-iodized sea salt mixture: Dissolve 1/4 teaspoon of non-iodized (iodine-free) sea salt into one cup (8 oz.) of warm distilled or bottled water soak for five to ten minutes two to three times per day. Dry by gently patting with clean, disposable paper products. Cloth towels can harbor bacteria and snag on jewelry, causing injury. Piercing a tragus is a bit more difficult than other portions of the ear, but it really looks unique. If you’re searching for something out of the ordinary, perhaps you’d like to give it a try? If you have any questions or would like to see if you are a good candidate for this piercing feel free to come in and speak with any of our experienced piercers.